Want us to keep a yearly backup of your audio? We periodically clear storage of archived and finished audio projects, so you should purchase our annual project back up if you want us to keep a copy. From £24 per year. We periodically clear storage of archived and finished audio projects. So you should consider our project back up if you answer yes to any of the following. Do you plan to update your on hold at any time in the future? Seasonal updates, Christmas, Easter etc. Message updates to advertise current promotions, offers etc. Do you want us to keep a yearly backup of your audio? Archiving / backing up your on hold source files means that we can tweak / update any element of your audio without having to redo the whole package. This could save you over 50% on changing your package in the future. Without a backup, you will receive the files you need for your on hold system – a master file. Whereas a backup contains every aspect of your on hold package, meaning that it can be re-worked and edited without having to start from scratch. 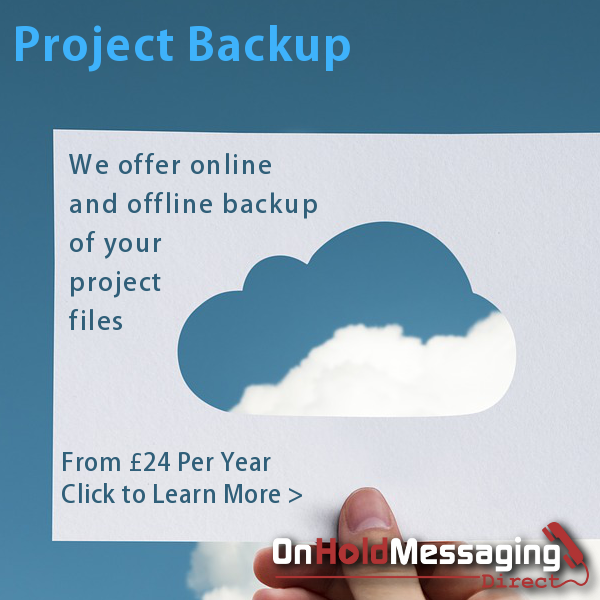 You should consider purchasing an on-hold backup if you think you will need any alterations doing in the future. The backup will enable us to resurrect your on hold package at any time, saving you time and money on editing, mixing and voice over re-recording fees. The backup contains all source files, but most importantly, contains your template that allows us to update and re-work your audio. Why doesn’t On Hold Messaging Direct keep a copy? As we produce hundreds of on hold productions, it is not practical for us store huge amounts of audio / music data that may or may never be used in the future. We have to regularly purge surplus content to make storage for new and recent projects we are working on. This is carried out periodically. For this reason, there is no guarantee that your project will be on our system if you come back to us for updates in 3 to 6 months for example, or if you lose or accidentally delete the audio. By purchasing a project backup, we will be able to access your audio and save you money on updates in the future (depending on your requirements). If you would like us to create a backup of your on-hold audio, remember to add it when placing an order with us.